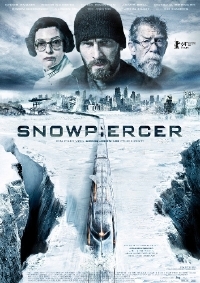 In a move no one saw coming because of the movie's poor box office performance in North America, Bong Joon-ho's Snowpiercer will get a second life â€“ as a TV show. Yes, you read that right. The movie that North American audiences didn't want to watch will be re-packaged and resold to that same American audience in shiny new packaging that will likely be more glitzier but far more banal than the original. I'm not convinced anything good can possibly emerge from this announcement but Tomorrow Studios (currently producing "Last Man Standing" and the mediocre "Aquarius") is certainly trying to minimize derision by hiring a guy who, on paper, might actually be a great choice to write the adaptation. Josh Friedman of Avatar 3 and War of the Worlds fame has been tasked with adapting Bong's apocalyptic drama about the last remnants of humanity who are living aboard a constantly moving train. There are a couple of potential highlights in this announcement. The first is that we're going to get more tales from the Snowpiercer universe which in-and-of-itself is kind of badass (more stories from the school cart with the crazy teacher please!) and secondly, Bong is executive producing. This could be nothing more than an empty title but I hold out hope that he'll have some say in the production which means the potential for this project not totally sucking is raised â€“ if even just marginally. The next big announcement, which will help determine how this project might play out, is the hiring of a showrunner. Fingers crossed this continues to show promise. In somewhat related news that is definitely much better, Bong's next project, a Korean monster movie titled Okja and featuring an international cast including Jake Gyllenhaal, Tilda Swinton, Paul Dano, Kelly Macdonald and Bill Nighy among others, has picked up a big chunk of financing from Netflix and Brad Pitt's Plan B Entertainment. This was a great flick, they just didn't advertise it properly. i disagree. one of the biggest disappointments i've ever seen. totally overrated. Well, anyone who says "overrated" loses automatically. All you mean is you didn't like it. No need to say it in a pompous way. Besides, the film was way better than it had any right to be. An entertaining surprise. Oh, and Tilda Swinton. well, saying "loses automatically" doesn't prove anything either. that's pretty infantile. by the way: by pointing out that i disagree i was clearly stating that it's my personal subjective opinion. in the end it stays what it is. a bad movie which doesn't justify all the hype. if you like it, fine. doesn't make the movie better. The movie was a great piece of entertainment. I'll watch out for the TV stuff, who knows what it'll be like! !